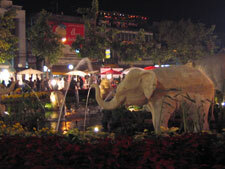 chiang mai is a beautiful city- feels more like a town in fact. much more clean and peaceful than the usually maddening bangkok. it abounds with coffeeshops, small bars, bookstores, and galleries. most of thailand’s prominent musicians and writers hail from here. it is set upon a series of canals, which used to be moats, as at one point the town was surrounded by a large stone wall. remnants of the wall still remain. it is surrounded by mountains, there are flowers everywhere, lots of sculptures, ancient samlors, and colorful markets filled with hill tribe wares. it is also much, much colder than either otto or i anticipated. i seriously mourned the lack of any winter clothes whatsoever, and ot positively screeched with pain and shivering. today was a whirlwind day of unabashed tourism. we rented a motorbike in the early morning from our little thai style hotel (a great deal which we found next to the night bazaar only after an hour and a half of traipsing from door to door from one full guesthouse to another). our first mission was to get to wat doi suthep- a beautiful temple at the top of the mountain. we wrapped gorgeous handknit scarves (50b) around our necks and sped through the city up the long twisting road. about 9 km up there is a quaint tourist market filled with hill tribe people and shops. a (very) long staircase intimidates you upon arrival, ascending to the top of the mountain and the temple. 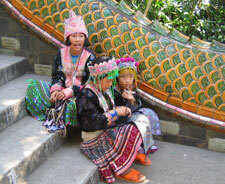 tribal children line the steps, singing softly in their bright costumes and dancing for handouts. monks tiptoe around in orange robes. tourists clutter with cameras. the temple has various areas decorated with buddhist statues, alcoves in which to pray. ot, being devoutly buddhist, had to attend each and every one. (our friend whit in ko phangan was just mysteriously attacked by a crazy thai man and went to the hospital with a twelve inch slice down his arm, the 2nd bad thing that has happened to him in a week or so when you count our motorbike accident, so ot felt it necessary to beg for good luck for all of us). he bought lotus flowers, incense, and candles to offer to the buddha. on the far side of the wat there are a series of large bells, which when rung echo majestically all over the valley. we went to the lookout and listened, breathing in fresh air and sunshine. ot was so excited to be somewhere new that he called his mom and babbled ecstatically, until she informed him that she is seriously ill- but that’s another story. afterwards we continued up the mountain, following signs towards the thai king’s winter palace. it is surrounded by rose gardens and neatly landscaped grounds. there is a certain reverence and adulation towards the thai king that i think only thai people can understand. i personally find it disturbing the extent to which he is deified, however like i have said before he seems like a nice man (hmmmph). i expected to be able to tour the interior of the palace, which really looked like your average wat (temple), but as it turned out the 50 baht entrance fee only allowed you to walk around the grounds. luckily it did pay off anyway- ot stumbled upon a famous thai musician (mr. chai muang singh) and took a souvenir photo with him. and that was the extent of the excitement at the palace. next was the zoo, since it was right there at the bottom of the mountain. 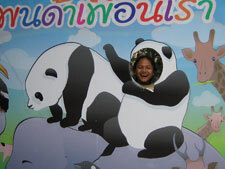 unlike the zoo in bangkok, it was pathetic. there were additional charges for most of the attractions, and the state of the cages was disgusting and sad. many of them were empty. the animals looked rather forlorn. the main attraction is a pair of giant pandas which have just been imported from china- thai people have been orgasming over these stupid pandas for the last year since they are thailand’s first. everything panda was on sale- panda masks, panda t-shirts, panda dolls, etc. ad infinitum. 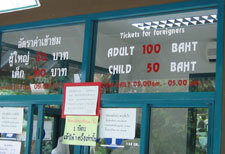 they also charged an extra 100 baht just to get a glimpse- i refused just on principal (thai people pay only 50 baht). after ot got his forgettable peek, we booked it out of there, never to look back. ot has a rich uncle in chiang mai, whom he hadn’t seen for twelve years. we went next on a wild quest to find his house on the back roads near chiang mai university. surprisingly enough, ot’s impeccable sense of direction led us straight to his house within ten minutes. it was a huge, sprawling thai style place with cool tile floors and a huge kitchen. and cute puppy dogs underfoot. his uncle was moving a huge dresser when we arrived- apparently he had just sold his place and was moving to the countryside to live peacefully on his ‘lam yai’ farm. he was a lovely man. he had put himself through law school, learned several languages working in the middle east, and had made lots and lots of money through various land deals. he was totally laid back, and absolutely fawned over ot and i. i felt an instant connection with him, and we talked over a huge dinner and several beers about life, religion, politics, you name it. he left us with a lonely bear hug and pleadings to come see him again soon. then the cold set in. we headed towards the night market, where i had hoped to find some handmade jewelry from the hill tribes, but there were no hill tribe jewelry sellers to be found. we wandered disinterestedly past stalls of woven handbags and torches, slippers and wall hangings. when we could no longer feel our fingers i decided we had seen enough. finally we spent the evening and most of the early morning at the legendary riverside bar on the waterfront, teeth chattering and fingers turning blue in the dark corner until our sangsom got us sufficiently drunk and we had warmed our extremities over the candles. the live bands were average, but entertaining and the ambience was great. we had an inebriated shopping spree at a 7-11 on our way home in the wee hours. i have learned to expect nothing upon a return to a place, and thus was not disappointed in the comparison of chiang mai now to when i visited two years ago. nevertheless, we made plans to head towards the village of pai the next morning.